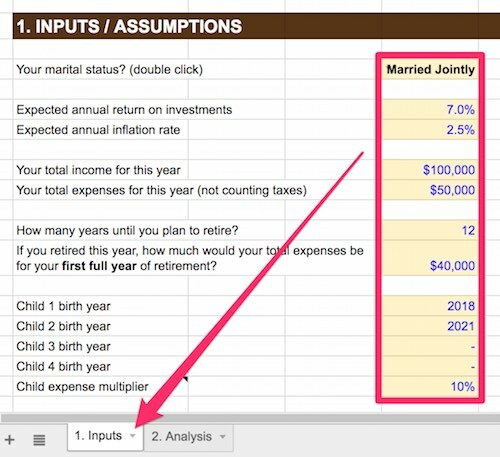 BONUS: Get our Google spreadsheet to quickly see how much you’ll personally save with a tax-deferred upfront strategy. See your results in less than 60 seconds. Which retirement account is better: a traditional tax-deferred account or a Roth account? They’ll say, if you believe taxes will be higher now than later, then contribute to a traditional account and get tax deductions now. If you believe taxes will be higher in the future, contribute to a Roth, take the tax hit now, then enjoy tax-free withdrawals later. Whether taxes are higher now vs. later, of course, has a lot to do with how much you earn now vs. how much you expect to earn later / in retirement, plus what tax rates are now vs. what you expect them to be in the future. Well, this is a false choice. Today I’m gonna show you that contributing to a traditional account upfront is ALWAYS superior for nearly all taxpayers, especially those who plan like I do to retire early. Contributing to a traditional account upfront is almost ALWAYS superior. The key is this: after contributing to a traditional upfront, you then slowly convert to a Roth IRA AFTER you retire. This lets you get the best of both worlds. It means you avoid taxes on money going in, avoid taxes on growth, avoid taxes on conversion (if done right), and again avoid taxes on withdrawal. In tax planning, a completely tax-free pass-through like this is the holy grail. For most workers, taxes are your single biggest expense. You may not notice it because they get withheld from your paycheck. But when you look at the size of your tax withholdings, you see they dwarf all other expenses — including housing. Taxes comprise more than ONE-THIRD of my gross income, and no other expense comes close. That’s why it’s super important to do efficient tax planning. And tax-advantaged retirement accounts are a key strategy for achieving this. In fact, the strategy I’m gonna show you is one of the rare few that’s universally true for nearly everyone. Plus, it snowballs over time: follow this strategy early in life and you WILL accelerate your retirement by YEARS. Follow this strategy early in life and you WILL accelerate your retirement by YEARS. When I talk about tax-advantaged accounts, I’m talking about them in a generic sense. “Traditional” simply means funding with pre-tax dollars and deferring all taxes until you withdraw. 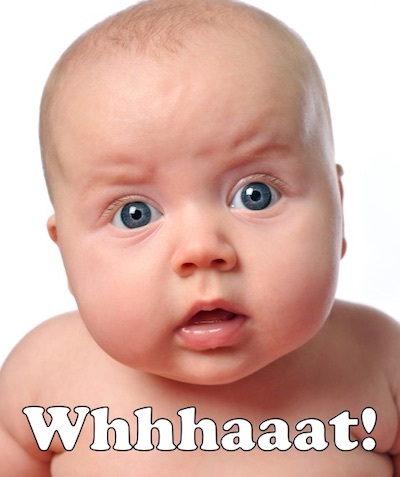 Investments grow tax-free, but they get taxed entirely as ordinary income upon withdrawal. “Roth” simply means funding with post-tax dollars, but everything is tax-free thereafter. It doesn’t matter which type you have. What matters for tax planning is which bucket — traditional or Roth — it falls into. 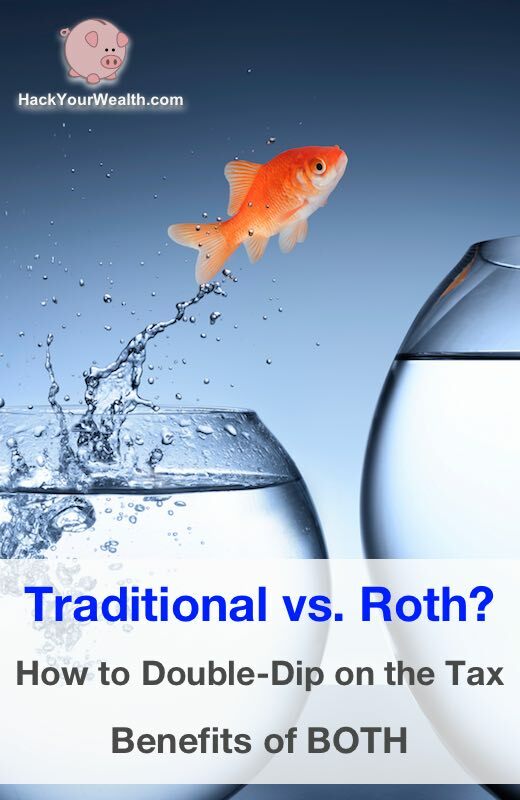 We mentioned above that traditional wisdom says if your taxes are higher now, go with a traditional account; if your taxes will be higher in the future, choose a Roth. Let’s take a look at how a traditional is always mathematically better when you have earned income, especially if you plan to retire early. First, if you can afford it, I strongly recommend maxing out your traditional contribution every year. Currently the max annual contribution is $18,000 ($5,500 for IRAs). To fund $18,000 in your account, you’ll need $18,000 of earned income, which you’ll deduct from your paycheck and you won’t pay taxes on that. To fund $18,000 in a Roth, you’d need as much as $29,800 of earned income (if you’re at the 39.6% marginal bracket), since you’re using after-tax dollars. This means you literally end up with more dollars in your pocket when you choose a traditional over a Roth. You literally end up with more dollars when you choose a traditional over a Roth. The extra dollars you save by shielding contributions upfront from taxes can now be reinvested in a regular, taxable account. If you do this every year, your taxable account will grow a lot faster than the Roth dude’s taxable account. And over many years of compounding, this gap will get big. We’ll show you how big in a second. The year after you retire (hopefully early), you’re gonna start doing a Roth ladder conversion. A Roth ladder is a technique where you convert a little bit each year from your traditional account to your Roth IRA. How much should you convert? Well, conversions are taxable events. But if you convert just under the standard deduction and personal exemptions limit ($20,700 in 2016 for married filing jointly with no kids), then you can move that money into your Roth IRA and pay zero taxes. Moreover, unlike Roth IRA contributions, which are capped at $5,500 annually and subject to income limit phaseouts, Roth IRA conversions have no cap and no income limits. Win. Now, the rules have always let you withdraw original contributions to a Roth IRA tax-free and penalty-free. But when you do a Roth conversion, there’s a twist: you have to wait 5 years before you can withdraw those original contributions. That’s where the “ladder” comes in. Each year you convert an amount exactly equal to the standard deduction and personal exemptions. Five years later, you start withdrawing those contributions tax-free. But wait, actually the IRS usually increases the standard deduction and exemption amounts each year to account for inflation. Because the Roth ladder has a 5-year waiting period, you’ll have to cover your expenses for the first 5 years from other sources. You’d probably have to do this anyway unless your total expenses are less than the standard deduction and personal exemption amounts. The last one is especially attractive, because qualified dividends and long-term capital gains (up to $75,300) are taxed at zero if you’re in the 10% or 15% ordinary tax bracket. 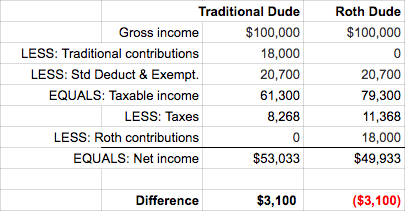 So, theoretically, you could live off $75,300 in tax-free dividend income, and convert $20,700 tax-free from traditional accounts to Roth accounts every year (with annual IRS increases for inflation). And…what if side hustles or rental income STILL push you above the 15% bracket even after you max out traditional contributions? You can actually push your traditional contributions “beyond the max” by opening a Solo 401(k). With a Solo 401(k), you can contribute up to 20-25% of your side income ON TOP of your $18,000 max individual contribution, up to a ceiling of $53,000. $53,000 for one person! You can push your contributions beyond the max by opening a Solo 401k. If you’re hitting that ceiling…um, your side business is earning a LOT, like upwards of $175,000. …I guess you’ll have to start paying taxes. That’s a good problem to have, consider yourself lucky. The Solo 401(k) is a beautiful thing, but deserves its own post, so I won’t get into the guts of it here. So…what the result of all this? 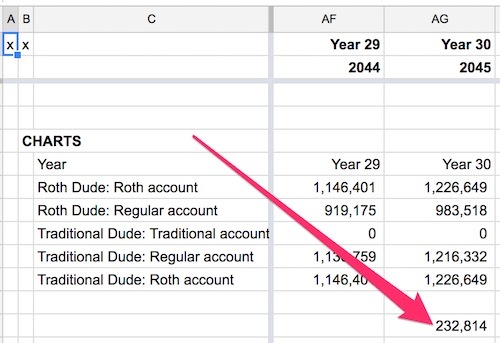 …after 30 years both traditional and Roth dudes have the same amounts in their tax-advantaged accounts, but the traditional dude has $232,814 more in his regular, taxable account than the Roth dude has in his. Across a lifetime, the gap becomes REALLY big. That, my friends, is because of the magic of compounding. Get our Google spreadsheet to quickly see how much you’ll personally save with a tax-deferred upfront strategy. See your results in less than 60 seconds. First, while both accounts let you withdraw penalty free when you turn 59.5, traditional accounts REQUIRE you to start withdrawing at 70.5, whether you need to or not. Roth IRAs don’t have such a requirement. You can keep your Roth money in the account as long as you want, and even bequeath it to heirs when you die. So another Roth benefit, aside from taxes, is no deadline for when you have to withdraw. With a Roth, you can even take out earnings penalty-free and tax-free before 59.5 for disability or a first-time home purchase, assuming you’ve had your Roth open for 5 years. But you only get penalty-free earnings withdrawal for medical or college expenses. Pre-59.5 Roth earnings withdrawal rules can get nuanced, so talk to an advisor if you really need to understand them. 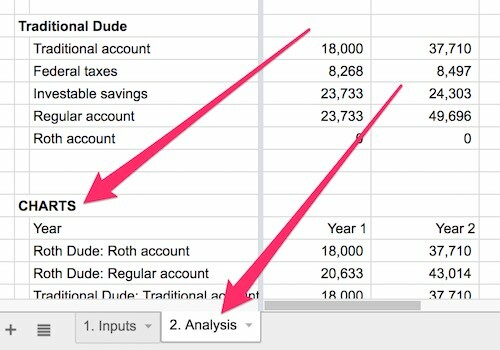 The point is, both account types have benefits, but you get the holy grail when you merge the two and get both benefits. Does the Roth IRA conversion strategy work for non-IRA accounts like 401(k)s? Yes, but with an extra step. If your money is NOT in an IRA, then you’ll have to roll it over into an IRA first, and then convert it into a Roth IRA, to avoid taxes and penalties. You can’t convert directly from a traditional non-IRA into a Roth IRA. So, we’ve seen that the key strategy of a Roth ladder is making traditional contributions to shield against taxes upfront, reinvesting the extra dollars in a taxable account and watching them grow faster than would be possible had you made Roth contributions upfront. This puts more dollars to work for you without working any harder or earning any more, simply by keeping those dollars out of Uncle Sam’s hands in the first place! Invest more w/o working harder / earning more, just by keeping it from taxman. So, unless you’re earning no income, never contribute to a Roth outright. If you’re earning nothing AND you also have no traditional funds that need laddering, then by all means contribute to a Roth all day long…assuming you don’t need that money for living expenses. But if you have ANY earned income, do yourself a favor and contribute to a traditional first, then later convert to a Roth IRA when circumstances are tax-favorable. Discussion: Have you used this strategy before? Any interesting twists or variations you’ve found? Leave a comment and let me know! Roths are also great for putting away found money. We sold my mother-in-laws house that we inherited after doing some repairs and used the proceeds to max out the Roths for two consecutive years before the April 15 deadline (plus a trip to Hawaii and new leather couches). $26K just that easy. Some side hustle cash from mowing lawns or part time endeavors can go straight to the Roth especially if you have expenses like transportation and phones you can write off against the earnings for tax free Roth contributions. I can’t find this idea anywhere, and i’m wondering if you could “hack” the system in another way. For example contribute to Roth IRA max of $6500 at the beginning of the year so that you gain the growth/interested/dividends (lets say 10% for ease of round numbers, so $650 in growth which would then continue to grow tax free) and then withdraw the initial contribution of $6500 to then use that money to fully fund the traditional and get the tax advantage for that same year?? The concept would be to grow the roth in interest/dividends which would grow tax free for retirement while also getting the tax advantage now from the traditional. Obviously would want to do the conversion latter later if possible, but say that never happens due to continuing to work through older age, would this be an alternative option to have roth and traditional growth? Has anyone done this or know the rules as to if this is possible. Hey CJ, you could do this and it would “work” but it wouldn’t be my strategy. It’s risky, exposes you to short-term price fluctuations (and trading fees), and the upside seems limited for the amount of work involved. 1. Make a Roth contribution at the start of the year, say Jan 1. 2. Invest it in stocks and see if it grows throughout the year. 3. On or before April 15 of the next year, liquidate the stock so you can withdraw the original Roth contribution in cash and put it into an IRA. 4. Attribute the IRA to the prior year and take the tax deduction on your tax return. 5. The money will sit in the IRA thereafter (you can buy the stock again once it’s inside the IRA – make sure you don’t run into the wash sale rule if you sold at a loss). 6. 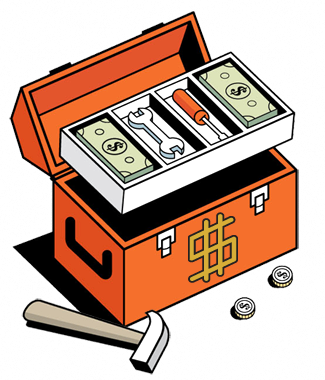 If you realized capital gain in the Roth, you can continue to let it compound. In the best case scenario, doing this over and over could result in a little bit of Roth gain each year before you transfer funds back into your regular IRA. However, there’s also a risk you lose money and there are a few reasons why I probably wouldn’t use this strategy. The main reason is it exposes you to market timing and therefore seems unduly risky. The market generally moves up over long periods of time, but can languish in any given year (or even year to year). This strategy presumes the market will move up every year — if it didn’t, you wouldn’t do this strategy. Actually, it presumes the stock price on April 15 (or whenever you liquidate) is necessarily higher than the price on Jan. 1 when you originally buy. You’re taking a risk that you’ve got the timing right…on both ends. What if the market tanked in a given year, like in 2001, 2008, or early 2016? And what if it meandered nowhere over a period of several years? Come April 15, you might have a hard choice to make: cut your losses, liquidate, and transfer to IRA (potentially less than the max contribution given your losses)? Or keep it in your Roth, don’t liquidate, but lose the IRA tax deduction? Buying and liquidating (with long holding periods in between) is investing, but trying to time the market every year seems like speculating. Second, this strategy will involve excessive trading fees and commissions, since you’ll have more trading activity in your account. Maybe this isn’t a big deal for you, but your max contribution is already capped at a few thousand annually, so the trading commissions — both at entry and exit — aren’t trivial in relative terms. Also, keep in mind that once your income exceeds the IRA tax deductibility phase-out, this whole strategy goes out the window anyway, since you won’t be able to claim an IRA tax deduction. It also probably won’t work with an employer 401k because the tax deduction is applied directly on each paycheck, not at the time of tax filing on April 15. This means you have to make your Roth 401k vs. regular 401k election in advance. I’m not sure it’s straightforward to recharacterize a Roth 401k contribution and get the money back, only to turn around and deposit it into your 401k instead. I haven’t seen such options in any of my past 401ks. I’m very interested in your thinking, because I find ‘working the system’ to be a fascinating and enjoyable use of time. Here’s what I don’t understand: viewed in isolation, this looks like contributing tax-free, and then converting tax-free. But the conversion is only tax-free because you are using the deduction/exemption of $20.7k. However, the tax-free value of the deduction/exemption is fungible, and if you have more than $20.7k in earned income, then you would be forgoing one tax for another, right? Sure this would work if you have no taxable income, but I don’t see that as being very likely. Also a credit card hint – double up on your Sapphire point bonuses (boni?) by opening business accounts for you and your wife. Again, thanks for the posts. I watch with interest. Hey Hawk, thanks for your comment. It is true the conversion is only tax-free because you’re using the deduction / exemption, and that deduction / exemption is “fungible.” So, if you earn more than this threshold, you won’t be able to avoid taxation — you either pay it from one set of income or another. This strategy is meant to work for people who have no other source of “earned” income, which in retirement — especially early retirement, years before social security kicks in — is possible, even likely. After all, unless you have rental or side business income, what would be the source of earned income post-retirement? Qualified dividends and capital gains don’t count because they are not considered “earned” income and they are therefore subject to different tax treatment entirely. So, the idea is: live off your qual dividends and cap gains which get taxed zero at much higher levels, and then use your earned income “allowance” to transfer dollars from traditional to Roth. The transferred dollars ARE technically taxed; they are just taxed zero. Lastly, even if you have some random income in a given year that would bust you above the deduction / exemption amount, you can always reduce your Roth ladder amount or even “pause” it for a year before resuming the next year when your one-off income goes away. Early retirees will have many years to finish transferring all traditional dollars into Roth, and there’s nothing that says it must be done continuously year after year. Re: the “double up” credit card strategy – yes, that’s definitely a way to accelerate points faster!